If any warning comes on, the hybrid system may not start by pushing the “POWER” switch. In that case, push it once again. These lights come on in the followingcases when the “IG−ON” mode is enabled. This light comes on when the “IG−ON”mode is enabled, even after the parkingbrake is released. If the vehicle speed rises above 5 km/h(3 mph) while the parking brake is applied,a buzzer sounds. It is dangerous to continue drivingnormally when the brake fluid level islow. When the yellow warning light comes on,it is no problem to continue driving. However,if the red warning light comes on,it indicates a serious problem and you cancontinue driving no longer. The lights do not come on even if theparking brake is applied when the“READY” light is on. The lights do not come on even if the“POWER” switch is pressed with theparking brake released. A red or yellow warning light turning onbriefly during operation does not indicatea problem. 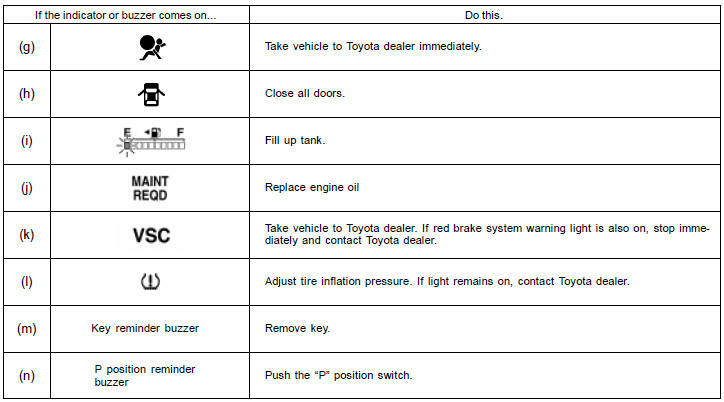 If any of the following conditions occurs,immediately stop your vehicle ata safe place and contact your Toyotadealer. The red warning light does not turnoff even after the parking brake isreleased while the hybrid system isrunning. The red warning light comes on orbuzzer sounds continuously. In either case, this can indicate thatthe brakes may not work properly andyour stopping distance will becomelonger. Depress the brake pedal firmlyand bring the vehicle to an immediatestop. The brake system warning light remainson together with the “ABS”and “VSC” warning light. In this case, not only the anti−lockbrake system and vehicle stabilitycontrol system will fail but also thevehicle will become extremely unstableduring braking. In the following case, drive directly tothe nearest Toyota dealer.The yellow warning light comes onwhile driving. The red and yellow warning light maystay on for about 60 seconds after thehybrid system is started. It is normalif it turns off after a while. Depressing the brake pedal repeatedlymay turn on the red and yellow warninglight. It is normal if the light turnsoff and the buzzer stops sounding aftera few seconds. You may hear a small sound in theengine compartment after the hybridsystem is started or the brake pedal isdepressed repeatedly. This is a pumppulsating sound of the brake system,and it is not a malfunction. You may hear a motor sound in theengine compartment when the brakepedal is depressed with the hybrid systemoff. The brake pedal stroke may be shortwhen you press the “POWER” switchwith the brake pedal depressed. You may hear a sound in the enginecompartment when the driver’s door isopened or the brake pedal is depressedwith the hybrid system turnedoff. However, this does not indicate anytrouble. You may hear a sound in the enginecompartment after the hybrid system isturned on or off. However, this doesnot indicate any trouble. The light and buzzer act as a reminder tobuckle up the driver’s seat belt. Once the “IG−ON” mode is enabled, thereminder light flashes and the buzzersounds if the driver’s seat belt is not fastened. Unless the driver fastens the belt,the light continues flashing and the buzzersounds 4 to 8 seconds. If the vehicle speed rises above 20 km/h(12 mph) without the belt fastened, abuzzer sounds. This light acts as a reminder to have thefront passenger buckle up the seat belt. Once the “IG−ON” mode is enabled, thereminder light flashes if a passenger sitsin the front passenger seat and does notfasten the seat belt. Unless the front passengerfastens the belt, the light continuesflashing. If luggage or other load is placed on thefront passenger seat, depending on itsweight, causing the reminder light to flashand buzzer to sound. This lamp comes on when the “IG−ON”mode is enabled and goes off after thehybrid system starts. This means thatthe warning light system is operatingproperly. If the fuel tank is empty, refuel immediately.This case is a temporary malfunction. Themalfunction indicator lamp will go off aftertaking several driving trips. If the lamp does not go off even afterseveral trips, contact your Toyota dealeras soon as possible. There is a problem somewhere in theengine, hybrid system, throttle controlsystem or warning light system itself.Contact your Toyota dealer as soon aspossible to service the vehicle. Your vehicle may not pass a state emissioninspection if the malfunction indicatorlamp remains on. Contact your Toyotadealer to check your vehicle’s emissioncontrol system and OBD (On−Board Diagnostics)system before taking your vehiclefor the inspection. For details, see “Emissions inspection andmaintenance (I/M) programs” on page 394. The light comes on when the “IG−ON”mode is enabled. If the anti−lock brakesystem and the brake assist system workproperly, the light turns off after the“READY” light comes on. Thereafter if thesystem malfunctions, the light comes onagain. 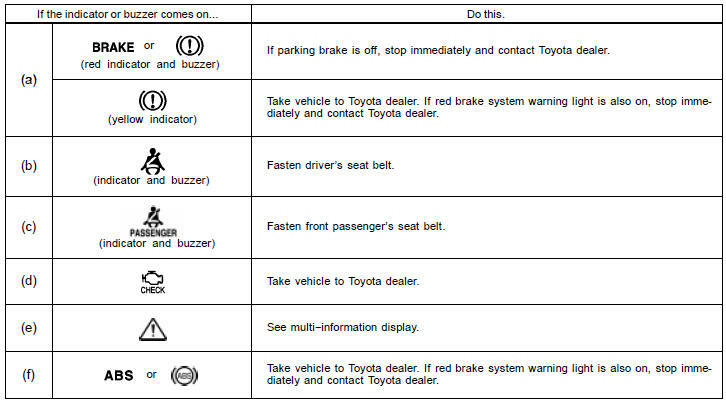 When the “ABS” warning light is on (andthe brake system warning light is on), theanti−lock brake system does not operate,but the brake system still operates conventionally.If any of the following conditionsoccurs, this indicates a malfunctionsomewhere in the parts monitored bythe warning light system. Contact yourToyota dealer as soon as possible soservice the vehicle. The light does not come on when the“IG−ON” mode is enabled, or the lightremains on after the “READY” lightcomes on. The light comes on while you are driving. A warning light turning on briefly duringoperation does not indicate a problem. If the “ABS” warning light remains ontogether with the red brake systemwarning light, immediately stop yourvehicle at a safe place and contactyour Toyota dealer. In this case, not only the anti−lockbrake system function and brake assistfunction will fail but also the vehiclewill become extremely unstableduring braking. The light may stay on for about 60seconds after the hybrid system isstarted. It is normal if it turns off aftera while. Depressing the brake pedal repeatedlymay turn on the light. It is normal ifit turns off after a few seconds. This indicator comes on when the “IG−ON” mode is enabled. It goes off afterabout 6 seconds. This means the SRSfront airbags, side and curtain shieldairbags and seat belt pretensioners areoperating properly. The warning light system monitors the airbagsensor assembly, front airbag sensors,side and curtain shield airbag sensors,curtain shield airbag sensors,driver’s seat position sensor, driver’s seatbelt buckle switch, front passenger occupantclassification system, “AIRBAG ON”indicator light, “AIRBAG OFF” indicatorlight, front passenger’s seat belt buckleswitch, seat belt pretensioner assemblies,interconnecting wiring and power sources. If any of the following conditions occurs,this indicates a malfunction of the airbagsor seat belt pretensioners. Contact yourToyota dealer as soon as possible. The light does not come on when the“IG−ON” mode is enabled or remainson for more than 6 seconds. The light comes on while driving. The SRS warning light and “AIRBAG OFF”indicator light will come on if there is amalfunction in the front passenger occupantclassification system. This light remains on until all the doorsare completely closed. This light blinks when the fuel level in thetank becomes nearly empty. Fill up thetank as soon as possible. At the first blinking of the light, the messageappears on the display to remind thedriver to fill fuel. Contact your Toyota dealer if the fill fuelgauge blinks. This light acts as a reminder to replacethe engine oil. This light will come on when the “IG−ON”mode is enabled, and will go off afterabout a few seconds. When you drive for about 7200 km (4500miles) after engine oil replacement, thislight illuminates for about 3 seconds andthen flashes for about 12 seconds whenthe hybrid system is in the “IG−ON”mode. If you continue driving without engineoil replacement, and if the drivingrange exceeds 8000 km (5000 miles), thelight will come on after the “IG−ON” modeis enabled. The light will remain on thereafter. If the light is flashing, we recommend thatyou replace the engine oil at an earlyopportunity depending on the driving androad conditions. If the light comes on,replace the oil as soon as possible. 2. Press the “POWER” switch twice toselect the “IG−ON” mode while holdingdown the trip meter reset button. Hold down the button for at least 5 seconds.The odometer indicates “000000”and the light goes off. If the system fails to reset, the light willremain flashing. This light warns that there is a problemsomewhere in the vehicle stability controlsystem. The light will come on when the “IG−ON”mode is enabled and will go off after the“READY” light comes on. If the light comes on while driving, thesystem does not work. However, as conventionalbraking operates when applied,there is no problem to continue your driving. The warning light does not come onafter the “IG−ON” mode is enabled. The warning light remains on after the“READY” light comes on. The warning light comes on while youare driving. If the “VSC” warning light remains ontogether with the red brake systemwarning light, immediately stop yourvehicle at a safe place and contactyour Toyota dealer. In this case, not only the vehicle stabilitycontrol system will fail but alsothe vehicle will become extremely unstableduring braking. This light comes on when the “IG−ON”mode is enabled. If the tire pressurewarning system works properly and tireinflation pressure is appropriate, the lightgoes off after a few seconds. This light comes on or flashes in the followingcases when the “IG−ON” mode isenabled. If any tire has low inflation pressure,the light comes on. The light goes off after the tire inflationpressure is adjusted to a specified level. When ready to be initialized, the lightblinks three times. If the system malfunctions, the lightblinks. Although it is no problem to continuedriving, have your vehicle checked byyour Toyota dealer as soon as possible. This buzzer acts as a reminder to removethe key if you open the driver’s door whenthe hybrid system is off and the key isinserted into the key slot. This buzzer will sound if the driver’s dooris opened while the hybrid transaxle is in“N”, “D” or “B”. 2. Open one of the doors. The open door warning light shouldcome on. The open door warning light should gooff. 4. Press the “POWER” switch twice withoutpressing the brake pedal to selectthe “IG−ON” mode. At this time, all thebulbs are checked in self−diagnosismode. All the service reminder indicators exceptthe open door warning light comeon. The yellow brake system, “ABS”and “VSC” warning lights turn off afterthe “READY” light comes on. There may be the case that the yellowbrake system, “ABS” and “VSC” warninglights stay on for about 60 seconds afterthe hybrid system is started. It is normalif they go out after a while. If any service reminder indicator or warningbuzzer does not function as describedabove, have it checked by your Toyotadealer as soon as possible.